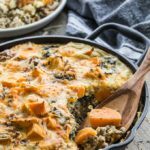 Sweet Potato Turkey Egg Bake is grain-free and loaded with ground turkey, spinach, mushrooms, sweet potato and eggs. And with a hint of apples, maple syrup and sage, your family is sure to enjoy this sweet and savoury brunch dish! Pre-heat the oven to 350F and use the oil to grease the bottom and sides of a 10″ cast iron skillet. Add the turkey, apple sauce, maple syrup, garlic, thyme, sage, salt and pepper. Cook on medium heat until the turkey is fully cooked and the liquid from the apple sauce and maple syrup has burned off. Add in the spinach and mushrooms, and cook until the spinach is wilted. This will only take a few minutes. Layer on the sweet potatoes. In a medium-sized bowl, whisk together the eggs and almond milk. Pour over the sweet potatoes, ensuring they are all coated with egg. Top with cheese. Bake for 45-55 minutes, or until the egg has set and the sweet potato chunks are cooked. Remove from oven and serve immediately. Store any leftovers in the fridge and enjoy within 3-4 days. Cut the sweet potato into cubes that are roughly the same size so they cook evenly in the egg bake. If you don’t have ground turkey, you can use ground chicken or lean ground pork. The recipe calls for dried thyme and sage. If you use fresh herbs, you will need to triple the amount as dried herbs are more potent. To keep this dish dairy-free, just omit the cheese.